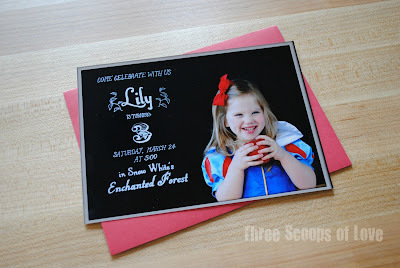 If you missed my overview of my youngest daughter's Snow White themed birthday party, check it out here. I wanted to revisit some of the details that made the party such a success. For her party invitation, I decided to try my hand at some fancy schmancy chalkboard lettering. I borrowed my mom's framed chalkboard that hangs in her hallway for the job. I knew it would be big enough that Lily could sit in front of it and I could get her and all of the text in the photo without getting the wood frame. I played around in Microsoft Word and printed off my text in the size I wanted. I laid it out on the chalkboard to get a rough idea of placement. Then, I took a piece of chalk and rubbed all over the back of the paper. I carefully laid the paper back on the chalkboard and went over the letters with a pencil. This gave me a VERY light outline of chalk left on the chalkboard. I then went over my guidelines with a chalk marker to get a more definite line. When I was done, I cleaned up a few smudges with a damp paper towel. Then, I propped the chalkboard up next to a window and sat Little Miss Princess in front of the negative space next to the letters. I made sure to place a piece of white posterboard next to her, opposite the window, to act as a reflector. I gave her an apple and let her big sisters stand behind me and make her giggle. I did some basic cropping and added a simple frame and it was done! I printed them out as 5x7 photos and stuck them in a red envelope. Done! Wow! You are so creative, and it turned out super cute.